If you haven't read the 5 page preview, then you will not know that Dale, held by the Hunters, reveals a big secret to them. The way this is handled, with Charlie Adlard and Cliff Rathburn showing Dales grief / madness / bitter laughter developing over several quick fire panels. This really works well. Back at the Church, where Rick and the other survivors are holed up, try to come to terms with the loss of Dale. Andrea, in particular, delivers a very moving piece on her relationship with him. As is Kirkmans way, a Walking Dead issue can be packed with dialogue and the dynamics of a group of survivors trying to get along as well as get by. 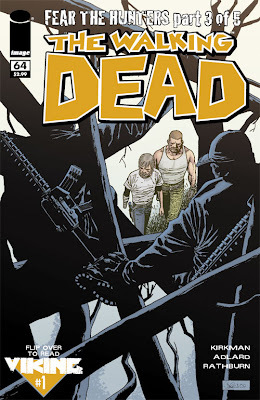 This issue, though not packed with action, delivers plenty of human drama, little scenes of heartbreaking humanity - like Glenn and Maggie tucking Sophia into bed, Carl crying in the chapel (there is no need for words to elaborate on why he is crying - Kirkman lets you make up your mind). Pretty much all the group get some time in this issue. We also get a glimpse into the lives of the Hunters (and they seem startlingly normal). The action, when it does happen, is sudden and happens towards the end of the issue. Rick has a handle on the situation, and there is a great final panel, full of pumped-up dramatics and the most 'comic book' splash page I have seen from Charlie Adlard (when you see it, you will understand what I mean). It looks great, and really sets up part 4 of 'Fear The Hunters' as the issue when it all really kicks off. Verdict. It may not be the 'all-out action' type of issue you may have expected, but this arc is building up to a messy conclusion. It is getting their with this titles usual style and flair. A solid instalment. 8.5 out of 10.